As the hangar door glided closed there was just a glimpse of what appeared to be a P-38 as we walked by, but could it really be a P-38? The sign said Lightning Aviation, it is perched at El Monte Airport. Larry Buchanan soon explains that what sits in his hangar is actually a prototype for a new kit, soon to be offered, of a P-38 Lightning, almost. It will be a twin engine home built, almost unheard of, and it will do things no other kit can even approach. The project’s brochure opens with an ominous description to set the scene. The legacy of the P-38 Lightning, it says, began in 1937, when the United States Air Corps issued a request for a high-altitude interceptor aircraft having “the tactical mission of interception and attack of hostile aircraft at high altitude”. It goes on to say that the specifications required a 360 mph airspeed and a climb to 20,000 feet in 6 minutes. Lockheed met the challenge with the P-38. Thousands were built and flown over every continent and ocean where they completed countless missions and helped to secure victory for the allied forces. Now, Larry explains there are four currently flying, they are priceless, and so highly sought after that collectors scour the globe in search of a single piece of one from a mountainside or sea floor. Larry and his partner, a law firm with ample resources, has set about to construct a P-38 composite kit with dimensions that will allow it to fit nicely in a standard hangar. 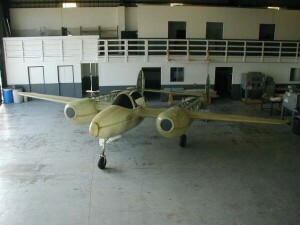 It is not strictly a scaled down model because to fit two people comfortably it had to be adjusted here and there to look like the classic and yet fit modern general aviation needs. There has also been ample engineering to make it more pilot friendly than the original while exceeding the long range, high speed capabilities that made the original such a fantasy machine. Kits are projected to be offered in the $300,000 range with an owner assist build hangar already constructed with eight bays and plans for two full time A&P mechanics to be on hand for assistance. Projected build time is four to six months. The construction will be Chromalloy inner structure with composite skins to combine strength and lightweight. The original project was so top secret that it was classified for ninety-nine years and no amount of government wrangling could cut loose a set of blue prints to aid in Lightning’s project. So Larry was able to obtain a set of plans from Russia, if you can imagine that, and use those in recreating the details that were not available any other way. 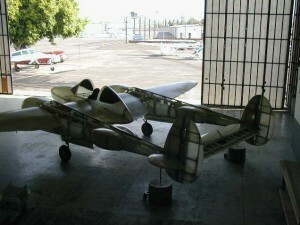 If you are interested in learning more about this monumental undertaking, check out their website at http://www.lightning38.com or call Lightning Aircraft at (626) 444-7739. Who knows maybe someday one of Larry’s P-38s will be one of our choices on the flying school’s roster of rentals, maybe. P38 I soon plan on retiring and have put away a considerable amount for this venture. you say it will have Heat and A/C could it be put on both engines???? slide back so the rider can enter safely??? I tried link http://www.lightning38.com and it does not work, any way of contacting the builder? Are you still in business and if so how is the kit coming?